Growing up on the Chesapeake Bay, and now residing on the Eastern Shore and living a stone’s throw from the ocean, I’ve been to Red Lobster twice in my entire life. Literally. I’ve never felt that I was missing out on very much, except for when it came to the basket of biscuits that they serve to the table beforehand. 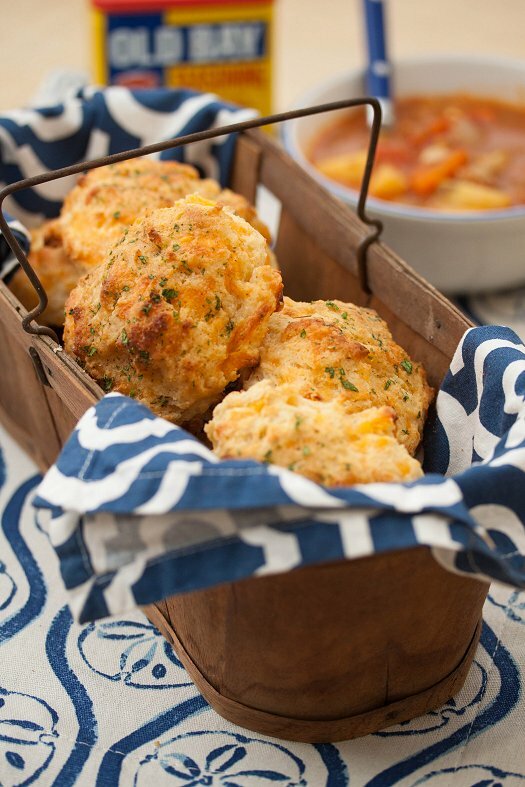 Tender buttermilk biscuits, studded with plenty of sharp cheddar cheese and a heavy dose of garlic flavor. How can you resist? They’re super easy and quick too, like 20 minutes and you’ve got biscuits! The simple ingredient list is just mixed together in a bowl, then dropped in biscuit-sized portions to bake. No labor intensive cutting-in of butter and kneading that regular buttermilk biscuits require. Once out of the oven they’re given a hearty brushing of melted garlic-parsley butter…to which I also added a hefty pinch of Old Bay. I loved the flavor the celery seed lent, as well as the slight hint of color from the paprika. Plus, you know how we roll on the Eastern Shore – we put Old Bay on pretty much everything we can around here. I made these to go alongside a batch of Manhattan clam chowder I’d made over the weekend, and it was sheer perfection. I usually serve some kind of crusty bread when I make seafood-based soups – but those days are done. Only these biscuits will suffice from now on! This recipe is one for the books, guys. I’ll definitely be making this one again and again! Preheat oven to 450 degrees F. Line a baking sheet with parchment paper or a silicone baking mat; set aside. Combine flour, sugar, baking powder, garlic powder and salt in a large bowl. Combine buttermilk and melted butter in large measuring cup, whisk to combine. Pour mixture over dry ingredients and stir until just combined. Gently fold in cheese. Using a large cookie scoop, distribute the batter evenly onto the prepared baking sheet. With clean hands, slightly flatten the tops of the biscuits. Place into oven and bake for 10-12 minutes, or until golden brown. For the topping, whisk together butter, parsley, garlic powder, and Old Bay in a small bowl. Working one at a time, brush the tops of the biscuits with the butter mixture.